Whilst the death toll has remained relatively low since M23 rebel forces captured Goma on Tuesday, it has nevertheless fuelled violence and protests in DR Congo’s already precarious Eastern region. The Alliance received reports that in Bunia, two taxmen had been killed as well as a woman who had been attending a Christian university and a policeman. People living in the surrounding areas of Bunia and other towns in the Eastern region such as Kisangani and Butemebo, have begun to protest against Goma’s capture. Looting and pillage has also taken place in these areas. Bunia, with a population of about 330,000 people, is approximately 370km from Goma, the largest city in Eastern DR Congo which has around 1 million residents. 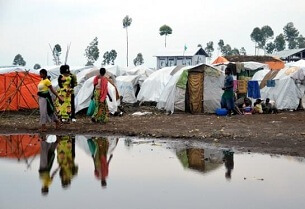 500,000 people were displaced from their homes when Goma was captured by M23 rebel forces on Tuesday. The Anglican Alliance received further reports that United Nations (UN) vehicles and offices had been targeted by some locals and foreign personnel harassed. Additionally, we have received reports that many of Bunia’s youth have marched through the city in protest over the inadequate intervention by peacekeepers. Eastern DR Congo is well known for being a vast area rich in natural minerals and difficult to govern. Bunia is the base of one of Africa’s largest UN Peace Keeping Missions. Many young people in Eastern DR Congo, including members of the army and the police, have joined the M23 since they took up arms against the government in April this year with promises of money from the M23 for their allegiance. “A place called Shake has been taken by the M23 and now they are saying they are going towards Bukavu town. The population is saying that President Kabila with all his government is selling the country and people are scared a lot because of hearing that the government soldiers will come again to fight the rebels,” said the local person in Bunia.